After a tragic loss of her mother, Tohru Honda finds herself living in bizarre conditions during the remodeling of her grandfather's house. 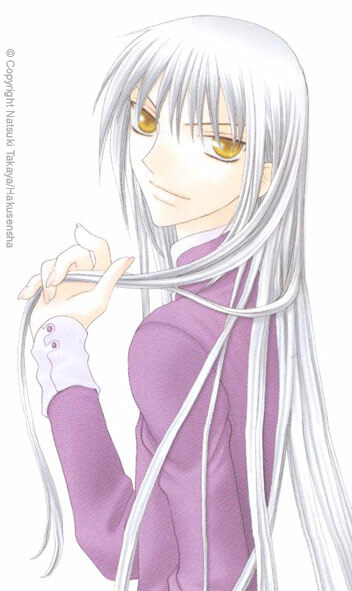 After being found by the Sohma family, she is taken in by Shigure Sohma. The Sohma's have a secret, though, that Tohru is burdened with. 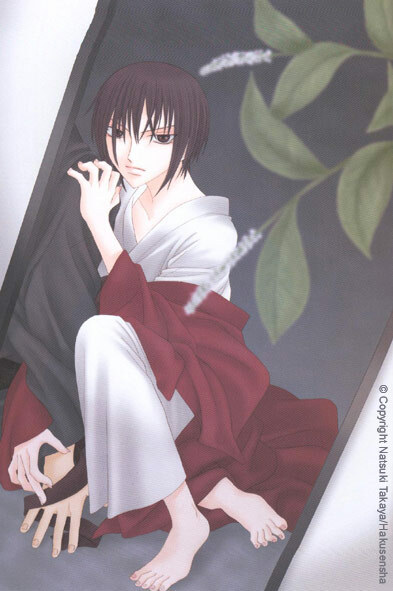 Thirteen of the Sohma's, Shigure included, are possesed by the vengeful spirits of the Chinese zodaic. They transform into their corresponding animal when hugged by the opposite gender. 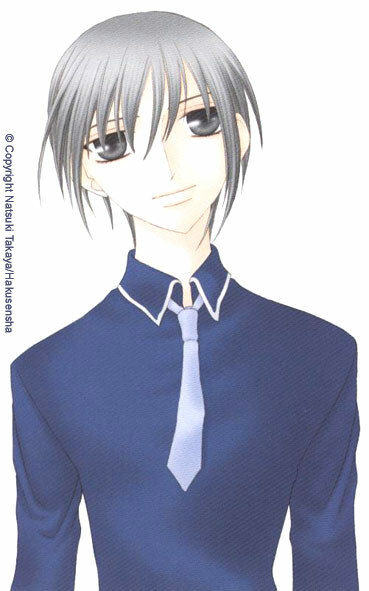 Shigure also houses Yuki Sohma, the rat of the zodiac, and Kyo Sohma, the outcast cat of the zodiac ledgend. It may seem funny at first, but it is dark... cursed. This is a truly heart-warming series by Natsuki Takaya. It's sweet and sad all at once. Tohru is sometimes so nice that you want to slap her, but at the same time wish you could be more like her. The struggles of the Sohma family will capture you and keep you reading throughout all of the over twenty volumes of this manga. A god was holding a banquet and the dog, boar, rabbit, dragon, ox, snake, tiger, sheep, monkey, horse, rooster, rat, and cat were invited. The rat decided to trick the cat and told him the banquet would be the next day instead of that night. So, while all the animals were off enjoying the banquet, the cat was sleeping, dreaming of the banquet he would never be able to go to. ;_; So, the cat never really forgave the rat (can't blame him). I got a comment from someone that these have slight spoilers. I read them over and realized that she (or he?) was right. So, this is a spoiler warning. 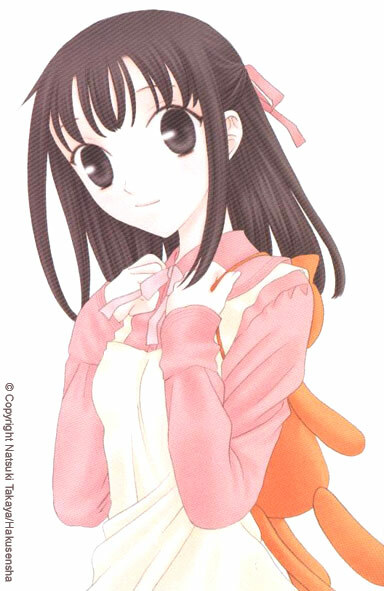 It's not really that bad, so even if you've never read Fruits Basket, you can still read this. It won't give away TOO much. Just basic stuff. And you'll know all the characters before they appear. But that's pretty much it. Tohru Honda is the optimistic main character. Despite all the tragities in her life, she always keeps a smile. She's the kind of person who looks at her life as a glass half full, not a glass half empty, if you know what I mean. She is very grateful for what she has. Sometimes she's so sweet I want to slap her! She has a thing for both Yuki and Kyo... who will she pick? I'm putting my bets on Kyo^^! 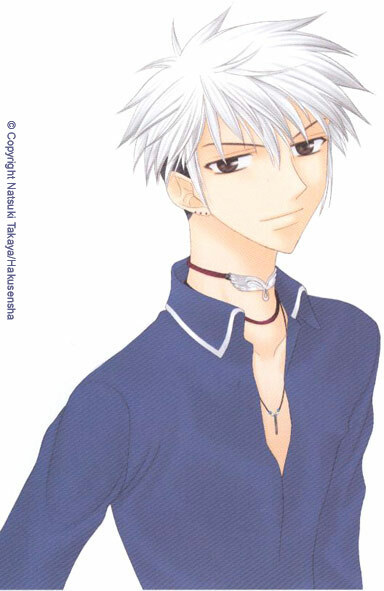 Momiji Sohma is that cheerful and slightly hyper active German-Japanese boy. He is possesed by the rabbit of the zodiac. He's extremely energetic and always seems to be happy. He is also talented with the violin. He and Tohru get along very well. I think Momiji is KAWAII ^^ but he's older than he looks. 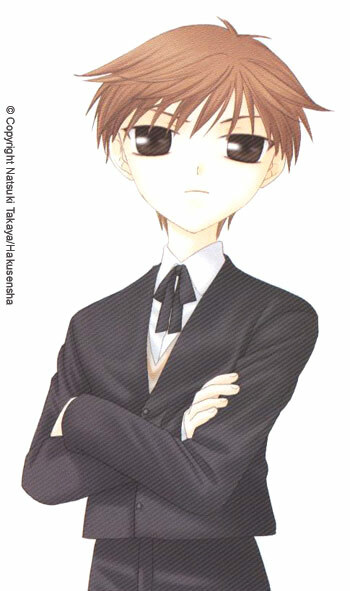 Even though he looks like an elementary school boy, he's actually only a year younger than Tohru, Yuki, and Kyo. He is also emotionally affected by the curse. Despite his "Happy happy joy" attitude on life, Momiji has had a tough life. He's probably the most In a way, he's like Tohru. But Tohru's not nearly as ADORABLE! Hatori Sohma is possesed by the dragon of the zodiac, but when he transforms, to put it bluntly... HE'S A SEAHORSE. He's also part of the Mabudachi Trio and Ayame and Shigure make fun of him because of his transformation. (I luv them! lol) Hatori is the family doctor-- he only takes family members as patients, but the Sohmas ARE a big family. 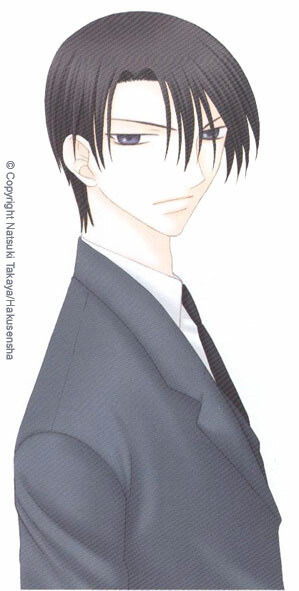 Hatori is almost blind in one eye, because of a tragedy that happened a few years ago *cough* Akito *cough*. When someone's memories need erasing, Hatori is the one to do it. He erases anyone's memories at Akito's orders. He's had his share of hard times though, when he had to erase the memory of someone close to him. Hatsuharu Sohma, or Haru, is the bull, or rather, cow of the zodiac. Haru has two sides, his "white" and his "black" sides, like the spots on a cow. When Haru goes "black" he loses control and becomes violent. He wants to beat Kyo in a fight for no good reason, and claims that Yuki was his first love (I don't think he's serious, though). Even though his black side is...er... bad... he's a really good person and has a special connection with Yuki and Kisa, both of whom were mentally scarred by certain incidents. He's also very close to Rin. 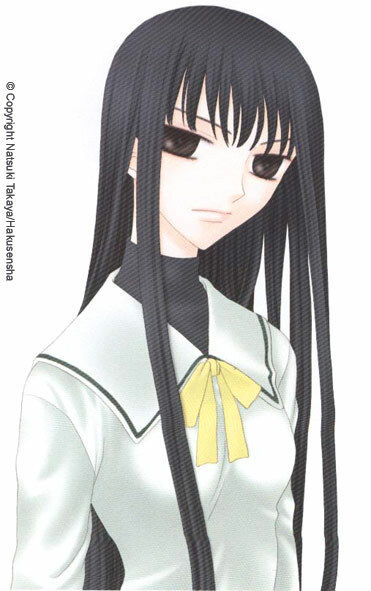 Ayame Sohma is the snake from the zodiac, and Yuki's older brother. He owns a shop that sells maid, stewardess, and nurses' outfits. Yuki and Tohru have their experience with that (laugh). Truthfully... Ayame is really stupid. He keeps trying to get close to Yuki, all in the wrong ways, and ends up having Yuki hate him even more. Well, not really hate, because as Yuki had said, he doesn't really hate Ayame, there's just "a rift" between them. Ayame is just thankful that they have some sort of relationship between them. The thing he is afraid of most is... "nothingness". Ayame is the final member of the Mabudachi Trio, and one of my favorite characters. 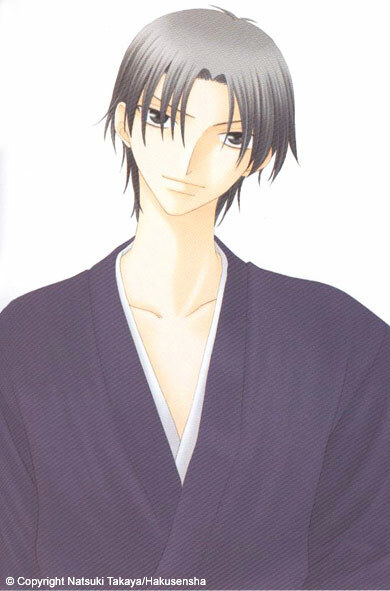 Ayame is really idiotic, and never gives a strait answer to anybody except Hatori, whom he has great respect for. Overall, he's a good-hearted person, though. 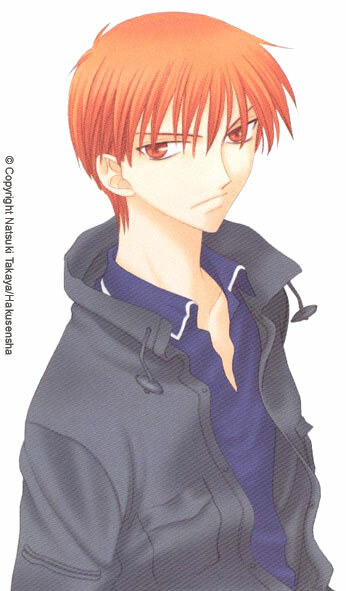 Kisa Sohma is the orange-haired tiger from the zodiac. After being teased and laughed at, Kisa had stopped speaking for a long time. After meeting Tohru, and with Yuki's help, she realized that she needs to keep trying and start talking again. Don't let the picture get to your head, her relationship with Haru is more brotherly than anything else. Then there's Hiro. Do you smell puppy love? ^^ Generally, she's a kind and innocent person, and I think she's absolutely KAWAII!!! 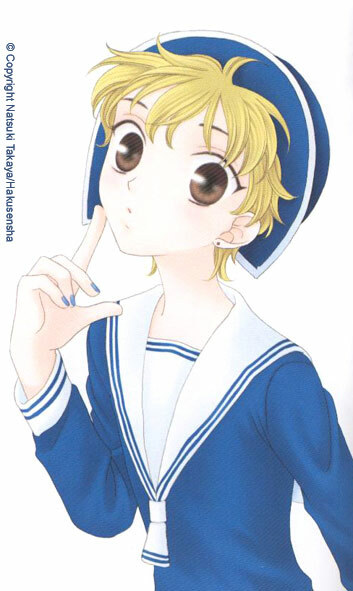 Hiro Sohma is the tempermental and slightly bratty sheep of the zodiac. On his first encounter with Tohru, he steals her notebook and her most treasured picture of her mother. Hiro only says he hates Tohru, though, is because he's jealous of how much time Kisa spends with her. Truthfully, he really likes Kisa, but is afraid to admit it because of Akito. This fifth-grader really packs a punch, but his soft spot will always be Kisa. 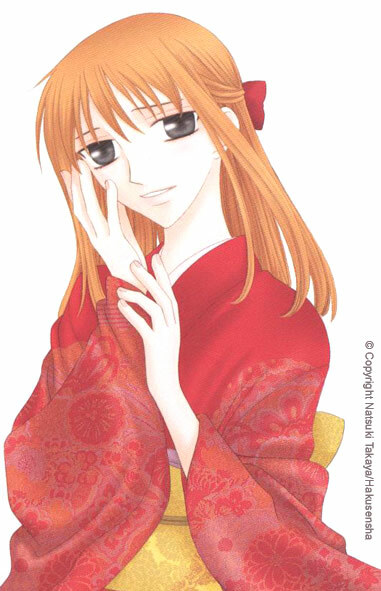 Ritsu Sohma is not the woman you see in this picture. In fact, she's not a girl at all! Yes, Ritsu Sohma is the shy and reserved... well... CROSS DRESSER. The truth is that Ritsu is ashamed of the curse, and he feels that dressing like a girl makes him feel better about himself. He doesn't want to disappoint his parents, and continuously apologizes to people. Tohru helps him slowly get over his fears. Rin is the horse of the zodiac who lives with Kagura and her family. She had a hard time with her parents and her childhood scarred her for life. She is often sick and spends a lot of time in the hospital, though she says she hates hospitals. She secretly dated Haru for some time, but then suddenly broke up with him after an accident which landed her in the hospital... literally. She remains to be a very mysterious character and is found sneaking around and spying on Haru. Kureno is supposed to be the rooster of the zodiac, but rumor is that he was released from the curse. The reasons are unknown, but it has something to do with his relationship with Akito, the head of the family. I'm not even sure if it's true though. For some reason, Akito shows special intrest in Kureno, and keeps him inside the main house and by his side more than anyone else. The one time Kureno leaves the main house, he stumbles into a certain someone. T_^ (And it's not Tohru!). Well, I guess mainly, you could says that he's like Akito's lackey. Akito is the cruel and cold head of the family. As Tohru had said, he may be smiling and polite, but his eyes are cold. He's tormented and torchured most of the cursed members of the family. Akito is like "The God" of the zodiac ledgend. All of those who are cursed must obey him and can't blame him for anything that happens. He may be cruel, but his cruelty comes from the fact that he doesn't have much time to live, and it was because it was decided at his birth. He is actually lonely and won't let any of the zodiac members to have a boyfriend or girlfriend becuase he is angry that they can be happy while he can't because of them. Overall, even though Akito isn't posessed by any animal, he is the most cursed of them all. 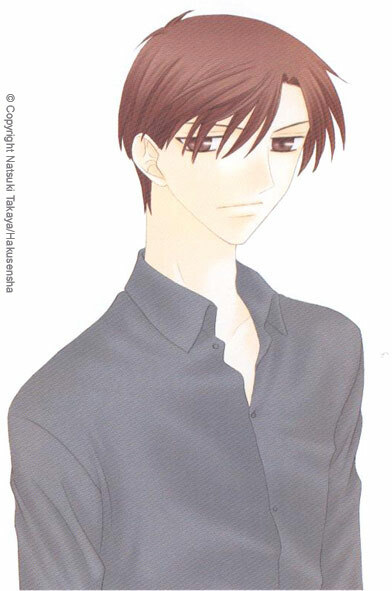 Kazuma is Kyo's adoptive father and the head of the Sohma dojo. Kyo calls him Shishou, meaning "master" but none of his other students call him that. He also teaches martial arts to Yuki, Hatsuharu, and Kagura. He and Kyo were close when Kyo was younger, but they grew distant as the years went by. They kept thinking that their feelings for eachother were wrong, so they stayed away from eachother. In the end though, they realize that they kept missing eachother when they shared the same feelings for eachother all along-- Father ane Son. Tohru and Kyo seem to be the ultimate couple. They don't really get off to a good start, but after a while they seem more and more comfortable with eachother. Kyo and Tohru really start to open up to eachother, sharing their troubles. Soon, Kyo realizes his feelings for her, but tries to distance himself from her because he's afraid he'll lose her if she finds out all of his many secrets. They overcome a major obstacle with Kyo's true form in volume 6. After, they start pushing eachother away a bit because they are both a bit afraid of the relationship. Overall though, I think they will definately be the ultimate couple. This is the youngest and cutest couple in the book ^^. Hiro and Kisa were mostly friends, until Hiro started liking her. Then, Kisa stopped talking, and there was nothing Hiro could do. After she started talking again their relationship seemed to be back on track, although Hiro was jealous of the attention Kisa gave to Tohru. They're still an icredibely kawaii couple ^^. Haru and Rin were secretly dating for some time. Then, after a sudden accident, Rin broke up with him when she was hospitalized. They're still in love with eachother, but Rin pushes him away. She still watches over him though, and this is her way of protecting him. 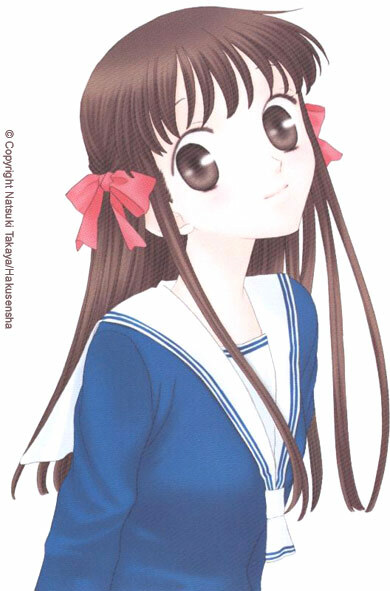 Mayuko is Tohru, Yuki, Kyo, Uo-chan, and Hana-chan's teacher. Mayuko, Hatori, Shigure, Ayame, and Hatori's ex, Kana were friends for some time. Mayuko had always like Hatori, but didn't want to admit it because Kana was her friend and she new they were going out. Shigure new Mayuko's feelings for Hatori and went out with her for a while so she wouldn't be lonely. That didn't exactly work out, though. Now, because of some tragedies in his life, Hatori is afraid of love, but I think Shigure is plotting something to get him and Mayuko together. They are definately a promising couple. This is sorta spoilery. Machi is one of the other student council members. She's shy and doesn't talk much, and makes frequent messes in the classroom. Yuki tried to talk to her and she really opened up to him. Though his motives are unknown, it's suspected that it's because he likes her. They prove to be a very cute couple. You wanna know? Do ya? DO YA? I'm not telling you! ^^ Go read the spoilers if you really wanna know! Okay... if you don't like spoilers.... ummm... why are you reading this? Anyway... here you go. The big bombshell.... AKITO IS A FRIGGIN WOMAN. *faints* Well, there's a shock. 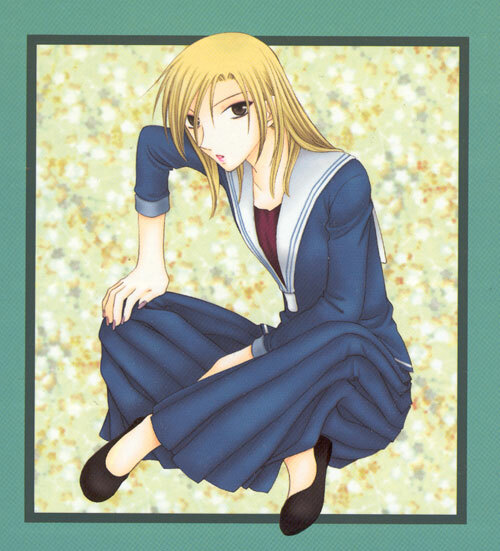 Akito is a woman, but for some reason, her mother, Ren, is making her dress like a man. Apparantly it's part of the curse. I feel bad for her. This is the reason why she's so bitter and doesn't like it when the zodiac members are in love and happy. It's unfair that they can be happy while she can't and it's their fault that she can't. 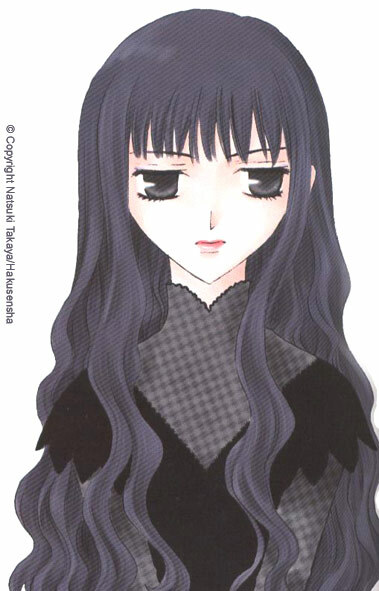 Okay... ummm this might disturb you a bit... especially if you thought Fruits Basket was a nice clean manga... Well. Here goes. Akito loves Shigure, but apparantly... she wants Kureno. She sleeps with him and Shigure isn't exactly thrilled about that, so he sleeps with Akito's mother, Ren, to get back at Akito (I know, wtf...) In the end though, even though they're drifting further and further apart, Akito and Shigure are in love with eachother, and they really are the ultimate couple. If you've read volume 3, you'll see Shigure saying that he had a dream, and it became a sad thing for both Hatori and Ayame, but for him, that dream still exists, and he will do anything to obtain it. What he was talking about is that before Akito was born, Hatori, Ayame, Shigure, and Kureno had a dream about Akito. They all went crying to Ren, telling her about Akito. I don't know much about this, and I don't really understand what relevence this has or what was actually in the dream, but I can tell you this much. Haru and Rin were going out for a while and had a relationship that pulled Rin out of her depressed state. Haru was always by her side and always made her feel happy. Then, Akito finds out about their relationship. "I hate women like you!" He said. He pushed Rin out the window. Yes... HE PUSHED HER OUT THE WINDOW! When she was in the hospital, she thought things over and realized that if their relationship continued, Haru might get hurt two, so she broke up with him. "I'm tired of you." she told him. Somehow, Kureno was released from the curse at some point. He doesn't know how, but even though he was the rooster before, he isn't anymore. Even so, he remains by Akito's side because he feels sorry for her.